Tropical and subtropical fruits are popular products, but are often highly perishable and need to be transported long distances for sale. The four volumes of Postharvest biology and technology of tropical fruits review essential aspects of postharvest biology, postharvest technologies, handling and processing technologies for both well-known and lesser-known fruits. Volume 1 contains chapters on general topics and issues, while Volumes 2, 3 and 4 contain chapters focused on individual fruits, organised alphabetically. Volume 1 provides an overview of key factors associated with the postharvest quality of tropical and subtropical fruits. Two introductory chapters cover the economic importance of these crops and their nutritional benefits. Chapters reviewing the postharvest biology of tropical and subtropical fruits and the impact of preharvest conditions, harvest circumstances and postharvest technologies on quality follow. Further authors review microbiological safety, the control of decay and quarantine pests and the role of biotechnology in the improvement of produce of this type. Two chapters on the processing of tropical and subtropical fruit complete the volume. 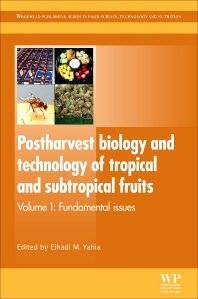 With its distinguished editor and international team of contributors, Volume 1 of Postharvest biology and technology of tropical and subtropical fruits, along with the other volumes in the collection, will be an essential reference both for professionals involved in the postharvest handling and processing of tropical and subtropical fruits and for academics and researchers working in the area. Professionals involved in the postharvest handling and processing of tropical and subtropical fruits and for academics and researchers working in the area. Elhadi Yahia is a Professor in the Faculty of Natural Sciences at the Autonomous University of Querétaro, Mexico, and is a consultant to several organizations including the Food and Agriculture Organization of the United Nations (FAO), the World Food Logistics Organization (WFLO), the United States Agency for International Development (USAID) and the United States Department of Agriculture (USDA).